The Vineyard Gazette - Martha's Vineyard News | MVY's Recipe for Success for Thirty Five Years? Stay True to the Music. 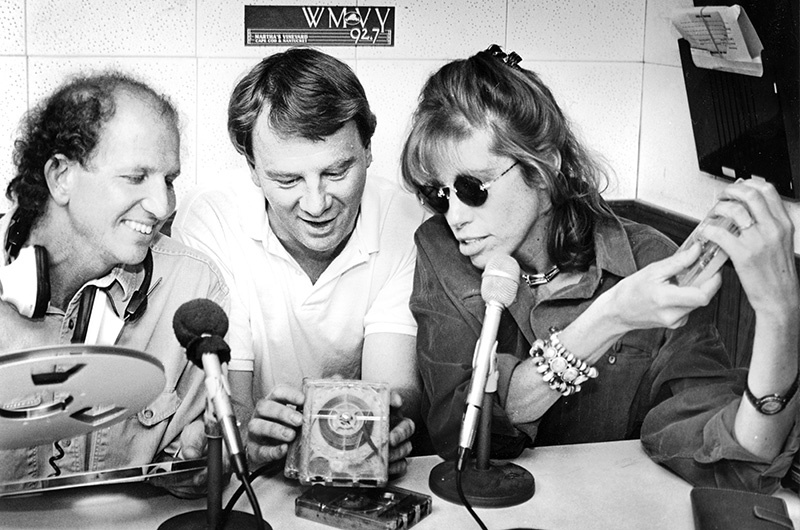 Keeping the music going, programming through the years: Jeff Damon, Barbara Dacey and PJ Finn. Thirty-five years ago, radio station WMVY went on the air from a tiny suite of studios here on Martha’s Vineyard. It was May of 1983 and Jeff Damon had just moved to the Island. He was a veteran radio disc jockey who had worked in Colorado, and become disenchanted with the ever tightening playlists dictated from corporate management. One day, just a few months after WMVY hit the airwaves, he tuned in, and the reaction was immediate. A few months later, Mr. Damon was the program director at the new radio venture. 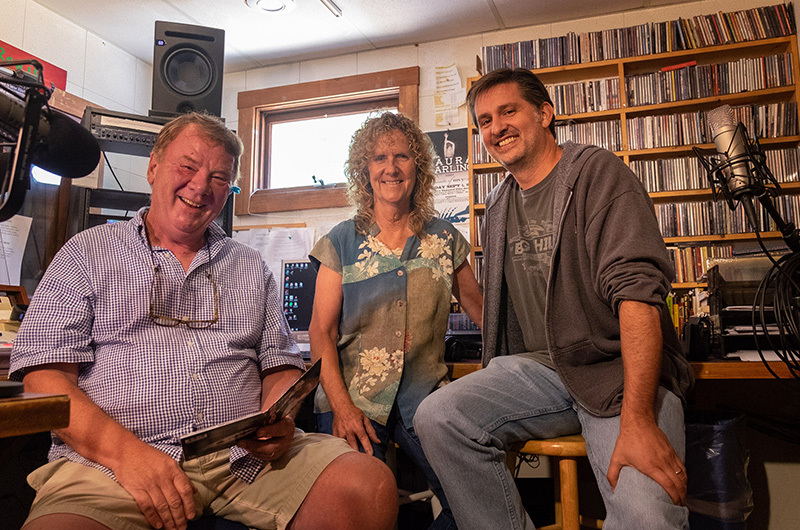 With the exception of the first few months of operation, WMVY has had only three program directors in its 35-year history. Recently, Mr. Damon sat down with the other two, Barbara Dacey, who was program director from 1993 to 2005, and current program director PJ Finn, to reminisce about what has kept the unique programming going for more than three decades. While the artists and the industry have changed over the years, the radio station program director still chooses music like it was done when the station first went on the air. Programming wasn’t limited to music. From the start, the radio station picked up a Vineyard vibe, with features aimed at people who were on the Island, and those who wished they were. In the early days, the playlist was limited by the small music library. Mr. Damon said things changed for the better when Ms. Dacey became program director, and she cold-called record companies to get more music. At a small radio station, program directors do lots of jobs. The three program directors always doubled as disc jockeys, playing their own picks. Ms. Dacey said air talent was just as important to the station’s overall personality as the music they played. Mr. Finn said the key to keeping listeners listening is the same as it was for his two predecessors. 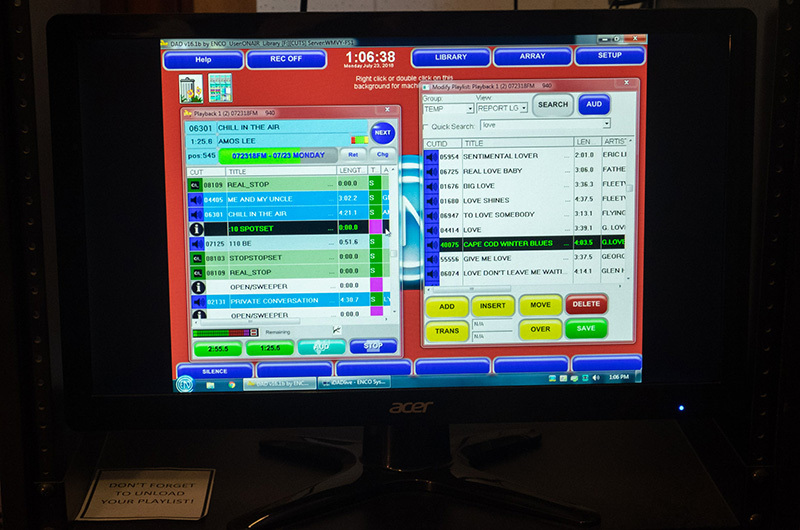 While the nuts and bolts of programming the radio station remain similar, there is a lot more music to choose from now. With technology changes and social media, artists have a lot more ways to get their music to listeners, and a lot more ways to make it known. that go into rotation, but the disc jockeys have plenty of latitude to introduce their own favorites, or songs they think will work on the air. The three programmers agreed that the station has changed over 35 years, as the artists and the music have evolved. But it all fits within the same framework that has made it staple on the Vineyard and far beyond its shores. This summer, to celebrate 35 years on the air, MVY has teamed up with the Martha’s Vineyard Concert Series to host a series of benefit concerts for the radio station. Tom Rush performed on July 25, and Mavis Staples will perform at the Performing Arts Center on August 14. Visit mvyradio.com or mvconcertseries.com for information and tickets. When my clients visit me they always ask me “ Doug what is that great radio station you have on? AND I reply, it’s not only the soundtrack to Doug’s life it’s the Soundtrack to the island. It’s good for Doug and thank you WMVY! And their reach is truly global! I once heard MVY streaming as I sat in a coffee shop here in Australia! 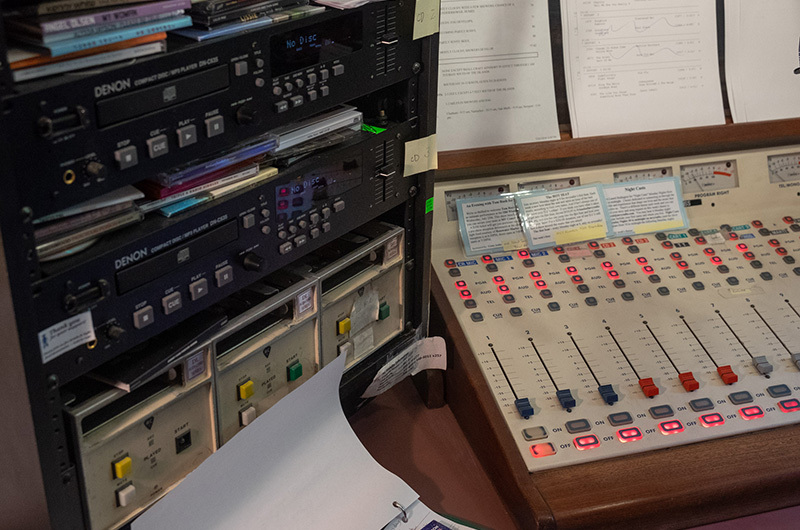 I love WMVY and have been a guest on-air. However, and I know I am in a minority, I would like to see MVY move more into the present with their programming — and be more adventurous within the limitations they have due to their format. There is much great music that would be possible to air that speaks to a younger demographic and not enough of it is heard. The formula has stayed the same, as this article indicates. But wouldn’t it be great to have a major station here that people under 40 tuned into? I can tell you that some may, but most of us aren’t very excited by MVY in terms of listening to the daily playlists and aren’t tuning in. Again, I’m sure I’m in the minority and have been told that the target demographic is old from the inside, but I just think eventually more pronounced change will have to come. Why not sooner rather than later? I still love you WMVY, this is constructive input! When we are on-Island WMVY is on in the kitchen, the living room, on the deck and out in the shed! An absolute linchpin to our being there! Also have loved listening in from all around the world through the Internet --- like most things Vineyardy please don't ever change !!!! Also big shout out to Jer-Bearwho whose show keeps it all real ! Sitting here drinking coffee and reminiscing with you!